Data harvested by enterprise file sharing and cloud storage company Egnyte shows Apple's iOS, led by the iPhone, is growing its share of the enterprise market, while Google's Android user base continues to contract. According to TechCrunch, Egnyte tracked which mobile operating systems were being used to access the firm's servers, with the sample comprising of 100,000 paying customers over the past year and a half. While the report does not reflect an exhaustive rundown of the worldwide enterprise market  U.S. companies accounted for 80 percent of the data, with the remaining 20 percent attributed to European entities  it gives an overview of how iOS and Android are faring in the corporate marketplace. Until recently, the share of smartphones and tablets running Google's mobile platform had been holding steady at 30 percent, while iOS devices accounted for nearly 70 percent of Egnyte's traffic. 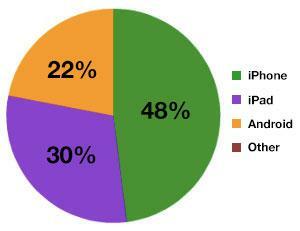 Over the third and fourth quarters of 2011, the iPhone and iPad took a 28 percent and 40 percent share of traffic, respectively. Interestingly, usage of Apple's iOS products flip-flopped during 2012, with the iPhone capturing a 42 percent share, while the iPad fell to 27 percent. However, preliminary data for the first quarter of 2013 shows Android impressions fell to 22 percent as the iPhone and iPad gained ground, accounting for a respective 48 percent and 30 percent of tracked users. Speaking to the results, Egnyte told TechCrunch that smartphones are likely being used for many business-oriented tasks like checking and responding to corporate email. Another factor could be the current limitations of tablets, which have yet to completely replicate the usability of enterprise laptops. "Apple seems to have at least temporarily won the hearts and minds of business users with its products accounting for about 70 percent of our traffic," the company said. "This is important because its a flip-flop from the days of old, where Apple products were rarely seen in the corporate landscape. Its also an indication that when BYOD wrested control over what devices consumers used from IT, they overwhelmingly chose an easy to use product that focused on UI and usability, perhaps even at times over depth." Thursday's report comes on the heels of another study conducted by mobile device, app and data security firm Good Technology, which found iOS devices accounted for 77 percent of all enterprise activations across its network for the fourth quarter of 2012. Over the same period, Android dropped from 29 percent of activations to 22.7 percent.